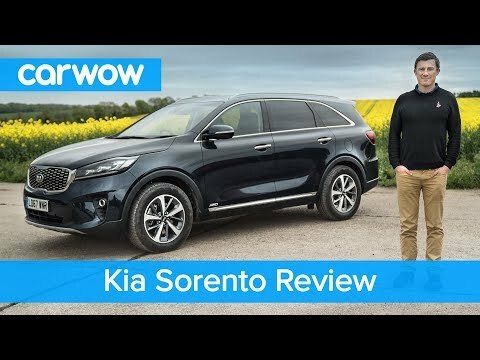 The 2018 Kia Sorento midsize SUV offers loads of amenities, an upper-crust-appearing interior, sharp looks, and one of the best warranties in the business. Slightly smaller than its Toyota Highlander and Ford Explorer rivals, the 5- or 7-passenger Sorento can't carry as much stuff and isn't quite as roomy. On the flip side, it's more maneuverable. It has a very roomy interior. I love our new Kia Sorento. It is a sleek looking, very attractive, sporty SUV. The interior is very roomy, and with the 3rd row seating, we can carry several extra people, as well as any baggage they have with them such as strollers, diaper bags, backpacks, etc. It rides very smoothly, even over potholes and railroad tracks. The dual a/c is awesome too, because the driver and passenger can each control the amount and temp of the air each receives. There is plenty of storage in the front of the vehicle as well, with storage space under the dash, in a closed compartment, more storage between the 2 seats, and more in the glove box. The drink holders are large enough to hold big cups without having to wiggle them back and forth to get them out. I also like the split 2nd row seating, so 1/2 of the seat can be positioned up, in the seating position, while the other 1/2 can be folded down. This is great if you travel with a large pet in an even larger pet crate. Our 70# silver lab sits securely in her crate as we take her for walks to the park. All in all, I would call this a family car because you can fit your kids, their stuff and even your pet!! Having a backup camera reduces blind spots. This vehicle drives smooth and has good gas mileage at an average of 26 mile to the gallon. The option with 3rd row seating provides plenty of leg room with reclining seats in 1st and 2nd rows. Provides a large cargo area with the 3rd row seats folded down. With the 3rd row in the upright position you are still provided with enough cargo space for smaller items such as groceries, sports bags, etc. Interior is quiet when driving. Back up camera is an excellent tool providing a clear image. Bluetooth capability provides hands free driving when using cell phone. Very nice looking car, great features. It has very nice seat warmers, and the seat warmers warm up very quickly, as well as the heating and air conditioning, which heat up/cool down in a matter of minutes, individual temperature controls for each passenger, rear view camera (reverse camera), when backing up/the car is in reverse, the car makes a beeping sound to alert the driver of obstacles, sleek interior, touch screen control panel, the key folds in and out so it does not stab you when it is in your pocket.